benzyrnill, 旎宫嘉坊: persistent support from Asoh Yukiko, my Crowned Queen from Japan. persistent support from Asoh Yukiko, my Crowned Queen from Japan. This is a gloomy morning. last night listened a strong sermon, but after returned to dorm, i know the connection between dad, God with me, is my treasure&never will be public like the bible. reviewing baby's smartness, really felt painful for so many occasions i mistaken his wonderful beaming response as stupid or meaningless. 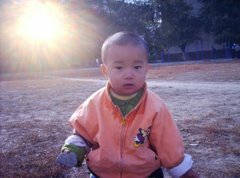 God, u know how dear my baby son, warrenzh, owner of site warozhu.com, hope of China and God of Universe, is. every moment in office i longing moment with him. every moment with him brings so many touching warm memories. Its a gloomy morning, but i know my second wife caring us. God, last night i met a girl closely, &her height reminds me of my girl zhou, who once appeared in QRRS. God, i never gave up her who is so pure&saint in ur care. God, u know how i love beauty, bring my girls in their prime time, in my prime time, my Empire asking for the blood-bond and shiny heirs. also, as today in my second wife's share, i need a dell game notebook, about ￥7000, a udisk, ￥300, a mobile ￥800, domains renewal ￥2000, hometown duty ￥1000. God, let me act in freedom. a day missing in sadness.^the most bright part today is around the noon. endured waiting for d/l. office once colleagues tentatively shown bonus dispatching among them. in the morning they summoned for meeting, i kept busy on desk as usual, for i decided its high time to switch my living support from the company, QRRS, a dying machine suffering fuel leaking by stealing mouse flocks among its staff, to Masheng (Asoh Yukiko), my Japanese Crowned Queen, my God of plenty&serene. cloudy usually let me indecisive, but hopeful tomorrow will bring me unshakable faith&confidence. the night it rains, cleaning&killing for me, sole for me, &so beautiful&formidable. watched rain in dorm's door. bought food&met beautiful girls in QRRS dorms but don't know where&who they r. roamed in dorm in music till after 10pm went to bed. woke up before 5am. ate breakfast, abiding God's bliss&quite enjoy it. its cool&bright morning. Masheng (Asoh Yukiko), stay every moment with me!, bring our babies sooner in our marriage! China nowadays greatly obliged to persons like Dr. Fang, any society needs trust should based on authentication. Dr. Fang is a real man, any Chinese should pay him salute. hope sooner world nowadays adopts the human right of net access. human right likely under the guidance of humanity, ie. the beneficial of human being. as to a Chinese on China mainland, i hope net can be more meaningful&positive impact upon the society's innovation. the UN Human Rights Council to adopt five new Internet freedoms: freedom of expression, of worship, from want, from fear, to connect. Universal Declaration of Human Rights (UDHR). Freedom from slavery. Freedom from torture. Equal protection under the law. dreamed of hunting killer.^dreamed of Japanese again in dawn. then dreamed passing Huangzhou, where i finished my senior middle school, in my hometown journey. 2 alumni, a Wang&a Zhang, met me. the Zhang on way to ship started to hunt for my life. its cloudy in this morning. sins in office damaged my network wire&tentatively shown it loosely on my desk. dog by it indicating of option to deprive me off Internet. fix it by replacing with a wire i stored. God, kill the thief in office. dreamed of Japanese family.^past 2 days with baby son in gaming full of joys, esp we succeeded all mission in game "Army Ranger: Mogadishu for PC". baby shared the moment reading the ending product message after fury war field. today baby&his mom ema, who said will join family gathering&rarely at home, so she suggested i busy with my own business, don't go over to accompany baby. dreamed of Japanese in dream. its sunny now. i hope i find fun today in office. God, let me connected with pulse&atop game industry. God, rid baby of boring. let him meaningful in silent moments in his life, like i do. a sunny day with new cyberspace footprint.^yesterday is busy. in night in dorm arranged claiming space for my hometown domestically, esp with 163&hexun, overnight. overseas profiles with yahoo&google already done years ago. this morning got up even earlier, likely before 6am when i settled in office. office sins both stayed at noon, while i enjoy the new space in memory of my ancestor, Zhudajiu, 朱大九. God, see my works there&lasting centuries, for ur glory granted under my ancestor since the Emperor of Ming Dynasty. tomorrow is lunar Mid-Autumn Day. i longing now for gaming together with baby son, warrenzh. sunshine already shines the valley&bees wooing for delicacy. God, prepare me for the holy moment, for the gathering. my girls, come&let's game, or make fun. Bright full moon after lunar Mid-Autumn day in sky above QRRS front space. baby glad&turns playful with his new clothes.